Space, the final frontier… A failed attempt at steering clear of a black hole results in you – and the entire crew of the starship Traveller – suddenly finding yourselves stranded in an unknown universe. You won’t get anywhere without some help from the locals, so make with the diplomacy or swing that fancy phaser around until someone starts sharing. The choice is yours, in this video game adaptation of Fighting Fantasy: Starship Traveller! Like most other Fighting Fantasy titles, Starship Traveller is an RPG of the choose-your-own-adventure sort. Although where the original is played with a pencil, a sheet of paper and a pair of dice, all you need to enjoy this version is an Android or iOS device. As someone who grew up playing more than a few gamebooks, let me tell ya, this is definitely the way to go. Means you won’t be able to ‘cheat’ by ignoring dice rolls though! Not like you’d do that anyway, right? Right. There’s more to this adventure than complex decision-making and luck-of-the-die combat though, as being in charge of an entire crew adds certain strategic elements to each encounter. On top of that, you also get to name and shape the lot (their stats, at least), giving the whole thing a sense of personality. So choose carefully when picking your crew for each mission, because you never know what might happen on that strange-looking planet up ahead. 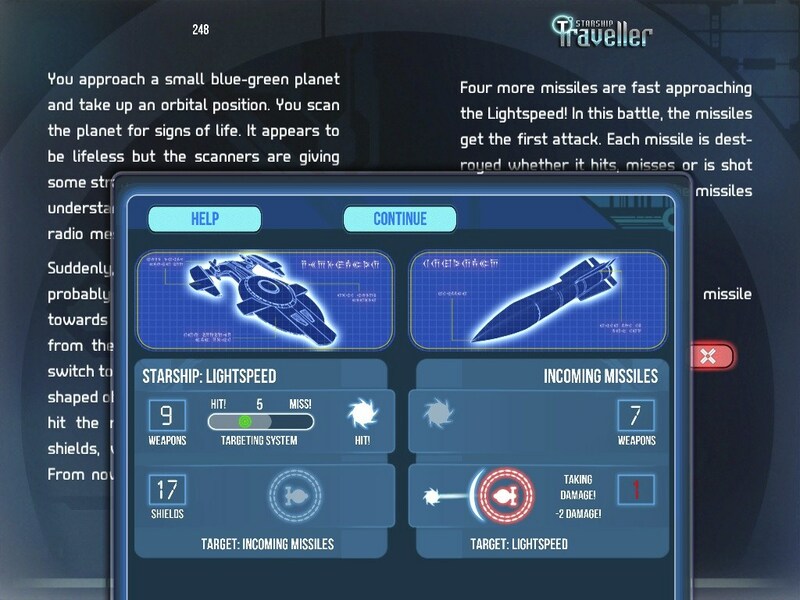 As with the mobile version of House of Hell, which I reviewed last month, Starship Traveller also comes with a bunch of exclusive features. 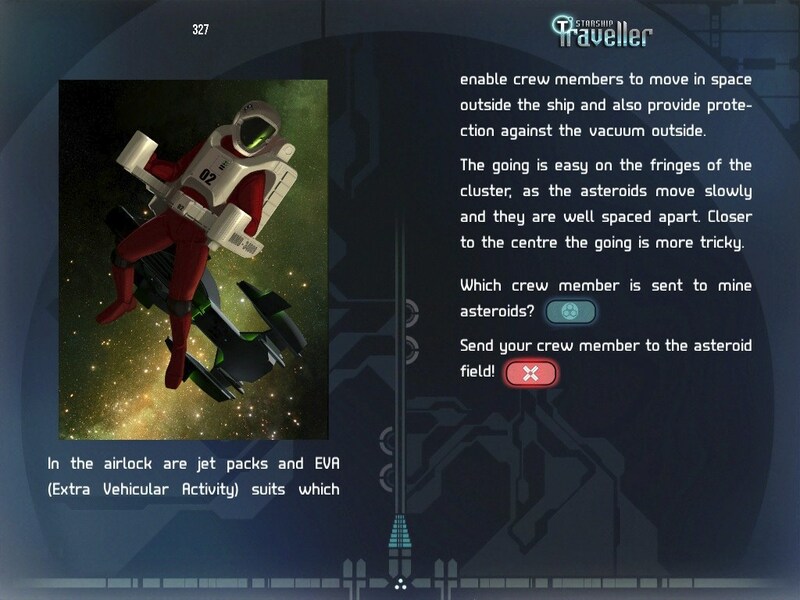 The bookmark system and difficulty setting make a return, along with a fancy ‘visual’ combat system and a map, which the game automatically updates as you explore the far reaches of space. Oh and something that’s bound to upset purists: the art has received a major overhaul! Given the rather dated and bland look of the original, I’d definitely rather have this new style, given a choice. The original dates all the way back to 1983, and this is a 2014 adaptation after all; nothing wrong with a hint of modernization here and there. I mean, the adventure itself remains unchanged, making for an experience pretty much identical to the original, and is that not what matters most? I’ll be publishing a full review at some point, but if you don’t feel like waiting for my (overly detailed) opinion, go ahead and grab Fighting Fantasy: Starship Traveller, either for iOS (iTunes) or Android (Google Play), after forking over $5.99. That’s six United States dollars by the way… not space bucks.